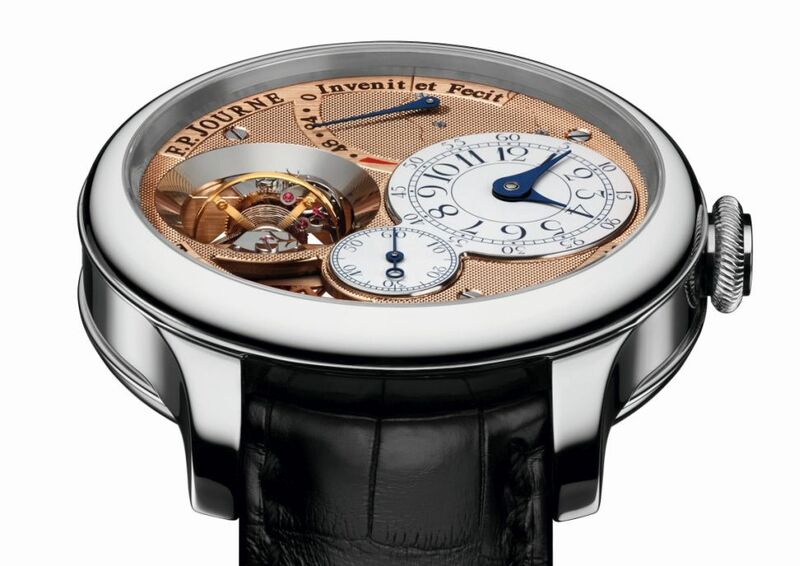 The innovative and revolutionary horological creator François-Paul Journe has inspired a generation of contemporary watchmakers with the originality of his creations, his quest for precision, his timeless and immediately recognisable style, and his respect for horological ethics and traditions. Fascinated by the tourbillon since his youth, François-Paul Journe began to make his first watch when he was 20 - entirely by hand. It was a tourbillon pocket watch. In 1991, he created his first tourbillon wristwatch, selling the very small number of examples to a handful of knowledgeable collectors. 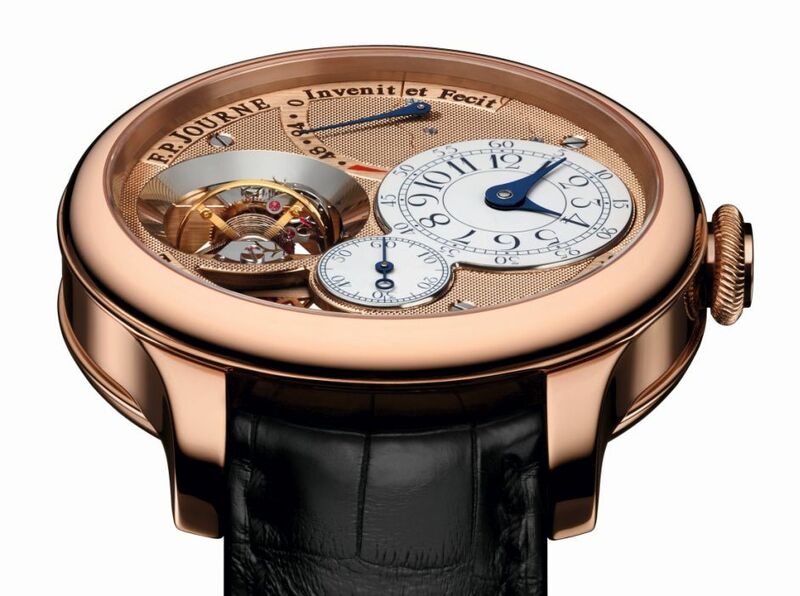 In 1999, he launched the first Tourbillon Souverain with remontoir d'égalité in wristwatch form. It was sold by subscription and was much soughtafter by collectors who rival with each other to get on the short list of 20 examples. 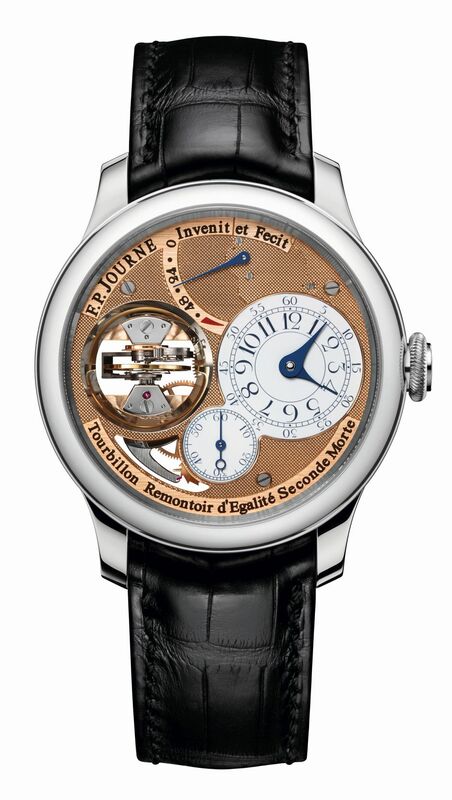 The year 2003 saw the birth of the new generation of Tourbillon Souverain, to which François-Paul Journe added natural deadbeat second. Then, to make the watches even more desirable, he produced his haute horlogerie movements in 18 k rose Gold, a first in the world of modern mechanical watchmaking. To celebrate the 20 th anniversary of this emblematic wristwatch, F.P.Journe has developed a tourbillon whose cage is vertical, rather than the traditional horizontal cage. "I designed this vertical tourbillon so that the tourbillon's functions remain constant whether the watch lies flat or is placed on its side, and the amplitude is subsequently the same, whether with a deployant clasp lying on the side or with an ardillon buckle lying flat". 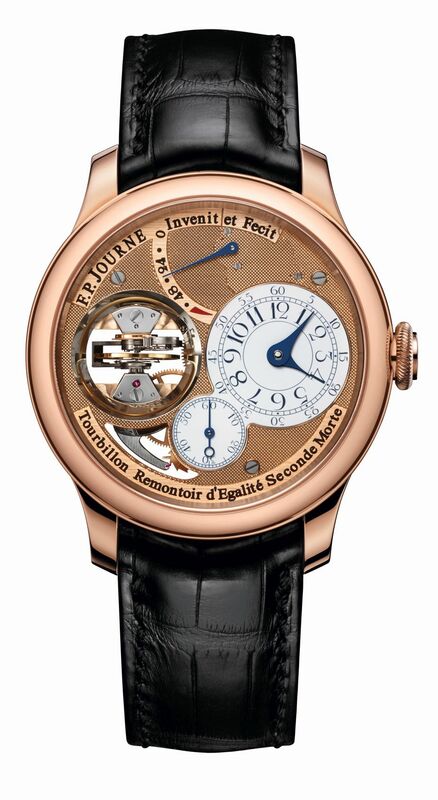 This vertical tourbillon with remontoir d'égalité and deadbeat second makes one revolution every 30 seconds. This is faster than the usual time of one minute, making the technical prowess even more visually astonishing. Surrounding the cage, a cone-shaped mirror-polished ring concentrates light, reflecting the tourbillon cage. 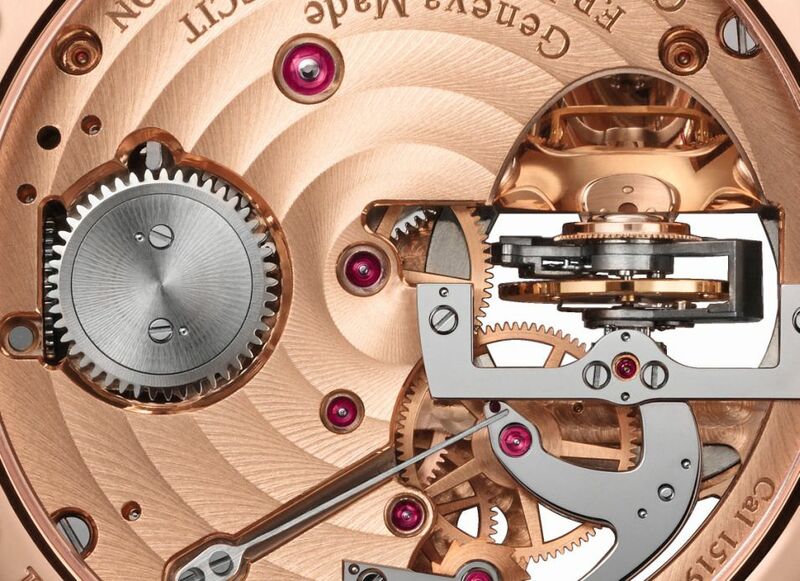 A second reflector was created on the movement side to provide light around the tourbillon cage. "From ancient times, humankind has constantly attempted to measure time by dividing it into equal fractions and inventing the notion of isochronism! Only with the arrival of the first mechanical clocks did specialists begin to seek a means of equalising the force reaching the escapement. The balance-spring did not yet exist and the so-called "foliot" balance had an irregular beat due to irregular transmission of force because of the imperfections of the gearing. At the time, clocks were equipped with just one hand, which completed a revolution once every 12 hours, since their degree of imprecision did not permit the measurement of minutes. After the invention of the mainspring, which would enable the construction of table-clocks, 15 th century watchmaker Jost Bürgi had the idea of adding an extra gear representing an independent system wound in short spurts by the mainspring. The escapement thus ensured a more constant flow and allowed several months of autonomy: this was the first remontoire or constant-force device! mechanism from the outside hands. This was because the latter were exposed to strong winds and might disturb the mechanism. interpretation: only the basic idea remains the same." Towards the late 17 th century, as clocks were becoming increasingly precise, watchmakers added a hand that enabled them to measure seconds. These "clocks", which became "pendulum clocks" thanks to the invention of the pendulum balance by the Dutch watchmaker Huygens, were almost naturally equipped with a 1 metre-long balance with a period of 1 second. The dial was marked out into 60 subdivisions so that the hand could jump from one second to the next. When the first watches indicating seconds were made, some 18 th century watchmakers wanted to achieve the same visual effect as on clocks. To do so, they invented systems extending the period of the balances, the best-known being the "crown-wheel escapement with pendulum" or the huge balance by Mr. Pouzait. Nonetheless, these systems were rapidly abandoned, since they were detrimental to precision. Thus, without an additional system, the hand started to beat out the half-second, the most widespread frequency of the time. The extreme ease with which time could be read thank to a seconds-beating hand, which remained motionless and only moved when the second changed, gave 19 th century watchmakers some new ideas. The first consisted of a small additional gear train activated by a spring connected to the mainspring. Each second, the hand was released by the watch escapement. This so-called "independent deadbeat seconds" offered the advantage of not affecting the precision of the watch and could be disconnected at will by the user. The second comprised an additional gear-train running from the escape-wheel to an additional seconds wheel equipped with 60 teeth held by a spring. This extremely simple system was extremely prejudicial to precision. Today, the Tourbillon Souverain is equipped with a "natural deadbeat seconds" device. The latter is mounted on one of the wheels of the constant-force device and cannot in any way affect the precision of the watch. The case, in 18kt rose gold or in platinum, measures 42mm x 13.6mm. It has double sapphire crystals. Movement is the Swiss manual-wind F.P.Journe in-house caliber 1519 with 32 jewels, 21,600 vph and a power reserve of 80 hours. 18kt rose gold movement. Balance: 4 inertia weights, flat Anachron balance spring with Philips overcoil. Pinned stud. Free-sprung. Spring pinned to collet. Pinned GE stud. 30 seconds Vertical Tourbillon with constant force and dead second. Escapement: 15 tooth escape wheel with 90° anchor fork. Functions are: hours and minutes at 3h00, small seconds at 6h00, power reserve at 12h00, vertical Tourbillon at 9h00. Finishing includes guilloche Clous de Paris on bridges. Circular Geneva Waves on base plate. Screw heads polished and bevelled. Pegs with polished rounded ends. Hour dial in enamel on white gold. It comes on an alligator leather strap with a rose or white gold buckle. 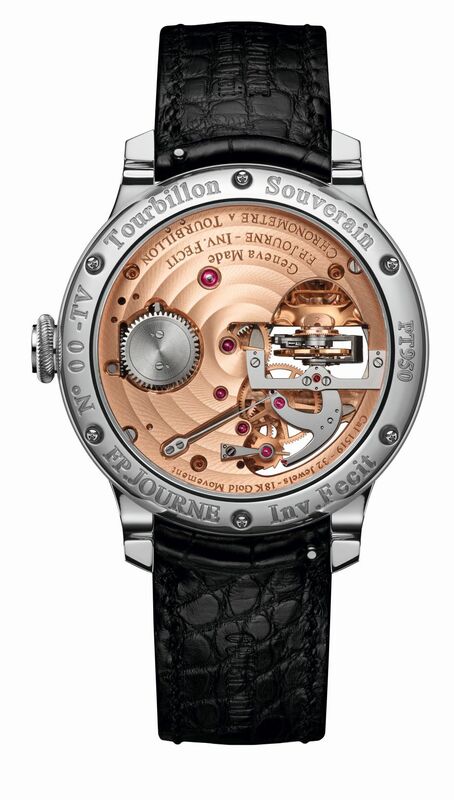 The new Tourbillon Souverain Vertical is stunning. The gold bridges form the dial and are engraved, painted, and decorated with "Clous de Paris" guilloché and a gorgeous Grand Feu enamel hour dial in white Gold. 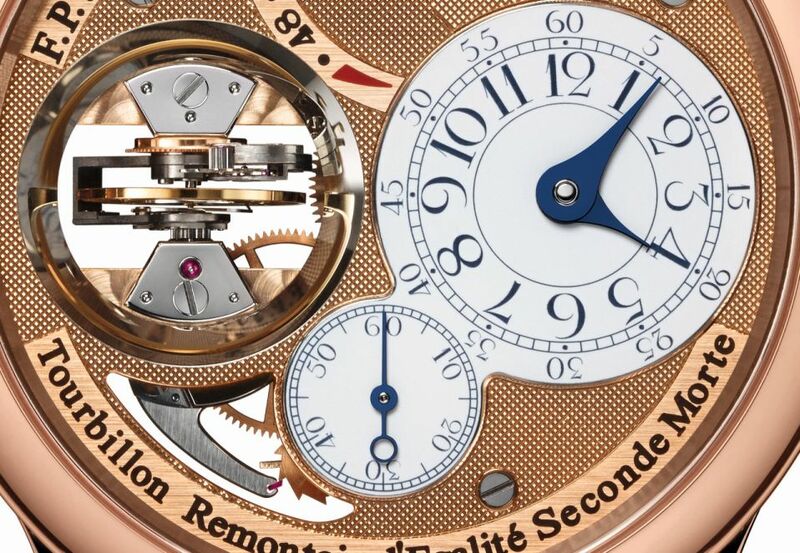 The tourbillon makes one revolution every 30 seconds and includes a remontoir d'égalité and deadbeat second. Journe designed some amazing details. The cone-shaped mirror-polished ring lights up the toubillon cage. On the movement side (sorry I don't have a clear picture) there is a second light reflector that literally looks like he scooped it right out of the baseplate. Amazing! Here is another photo under different lighting. Only the platinum case version was available to see. I'm sure there pink gold version will be amazing as well. Saw this watch in person the other day. Actually not as thick as it appears in stock photos. Stunning!! Plus the lugs curve sharply down. This allows the watch to sit comfortably on the wrist. I was surprised how wearable the watch was.